1. To ensure proper thread engagement and accurate torque readings, clean ALL threads in the block. Chase if necessary with ARP Thread Chaser. 2. Clean and inspect all hardware prior to installation. Look for obvious defects or shipping damages, plus proper fit, length and dimension. 3. Position the chamfered side of the washer on the bolt so it faces the bolt head. This is done to clear the radius on the under head of the bolt. Note: Improper installation of the washer will cause premature bolt failure. 4. If the cylinder head bolts protrude into a water jacket, lubricate the threads of the bolts with ARP THREAD SEALER. 5. If the cylinder head bolts protrude into a blind hole, lubricate the threads of the bolts with ARP ULTRA-TORQUE FASTENER ASSEMBLY LUBRICANT. 6. Install the cylinder head(s) and check for binding or misalignment. 7. Lubricate the under head of the bolt and the washers with ARP ULTRA-TORQUE FASTENER ASSEMBLY LUBRICANT. Then install the bolts into the cylinder head and tighten them hand tight. 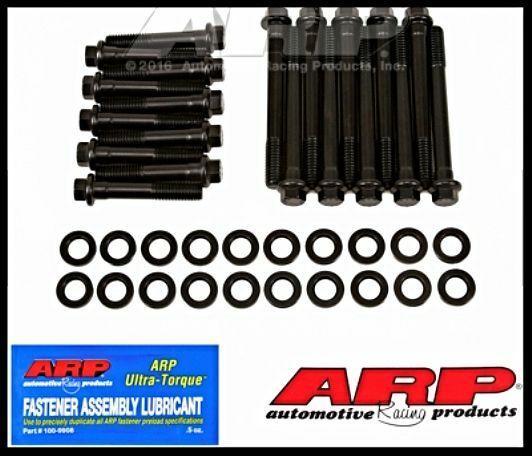 ARP recommends using the ARP ULTRA-TORQUE FASTENER ASSEMBLY LUBRICANT that is provided with each kit as opposed to motor oil. 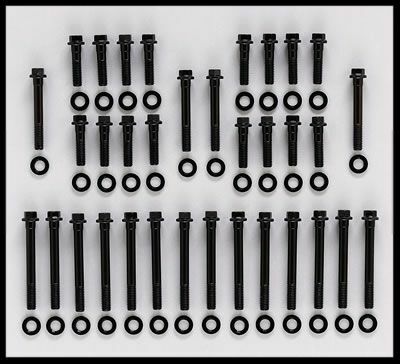 This is due to higher friction on the bolts as well as inconsistencies in the clamping force of the fasteners when motor oil or other low quality lubricants are used. 8. Following the manufacturer's recommended torque sequence tighten the bolts in three equal steps to 70 ft lbs with ARP ULTRA-TORQUE FASTENER ASSEMBLY LUBRICANT.